This is a good breather episode, and needed since I was unsure of the show being able to keep up the momentum. Given the bloody nose Rustal gave them, it is unsurprising there is a lot of contemplation for a myriad number of our heroes, a good portion of who have certain affection for others. In a rather interesting turn of events, after being impaled by Mika and having all the requisite Iron-Blooded death tells (bloody body and bloodshot eyes), Julieta survives and comes to a final conclusion after being Rustal’s shield. 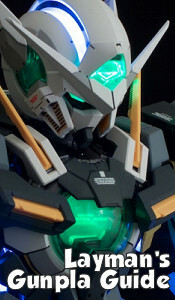 Whereas Galli-Galli, McGillis, and even Mika utilize the Alaya-Vijyana system and its variants, Julieta comes to the conclusion that she would rather improve upon herself as a human. It’s a nice enough conclusion after a long period of uncertainty whether she would have the operation, and establishes her in good stead with her superiors. Then we have Isurugi, who actually sacrifices himself for McGillis. Shocking, as it not just shows McGillis being bested in Agnika Kaieru’s mobile suit, but also a bit of Isurugi’s past. Turns out Isurugi’s loyalty to McGillis also stems from a very Ein-esque backstory except instead of Mars he grew up in the colonies. To be sure it doesn’t faze Galli-Galli, and I’m sure it doesn’t faze much of us either. It’s another death I would consider ‘fair enough’ given the circumstances, and it shows the influence of McGillis’s vision to a Gjallarhorn officer who isn’t young and naïve like who has been shown in previous episodes. Other than that, not much else to say about it. 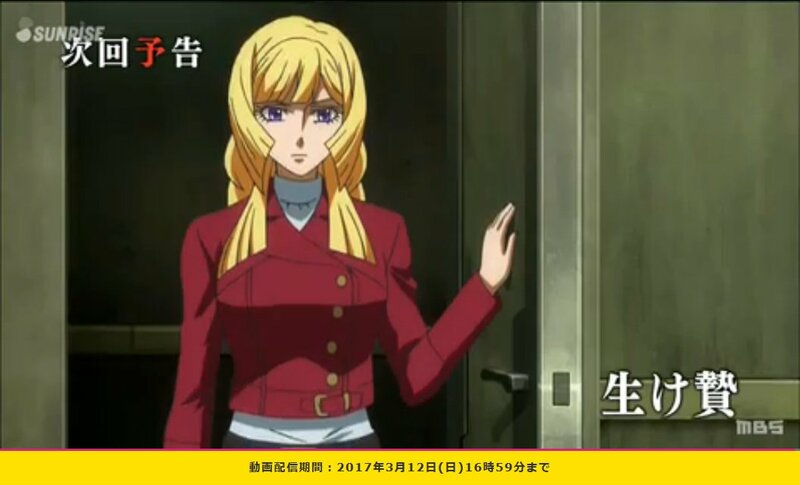 Finally, we have a cadre of Tekkadan members coming to terms of what has been happening. Zack continues to question whether or not they can win against insurmountable odds while Hush and Dane maintain their focus on work. This has happened before in previous episodes, and it is getting old, so I hope something comes from it soon. There’s a nice moment where Akihiro (alongside Dante and Chad), comfort one of the former Human Debris who fought alongside Aston during the Canada battle so many episodes ago. 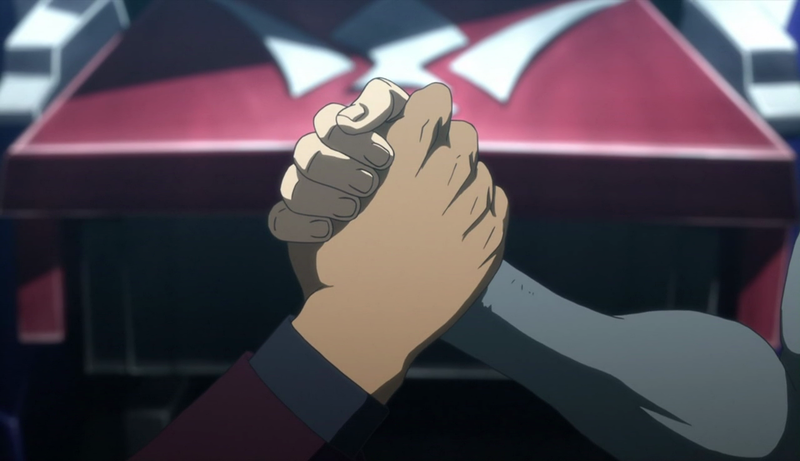 It’s a good moment showing how links between such people continue to be maintained and even after everything, Akihiro still makes it his mission to have former Human Debris be part of the Tekkadan family. Then of course there’s the usual uncertain Orga and resolute Mika scene at episode’s end, but that’s usually boilerplate enough as it is. The ultimate scene though is after Yamagi tells off Orga during his usual existential funk after Tekkadan members die. It’s a great scene where Eugene is thankful of Yamagi being direct to his superior, and reveals something I thought would never have happened – Shino acknowledging Yagami’s feelings for him exist (and not teased as a “Does he know or not?”). To be sure, when Eugene gives him the ‘Isn’t it obvious?” remark to him after he realizes it, Shino’s usual eager self is not in the slightest bit weirded out by it, and sees it as just being part of this weird collective known as Tekkadan. It’s one great final moment with Shino when he was still alive, and is something worth overriding his forlorn attempt to end everything. These are good scenes, Brent. They showcase the resolve of our characters and make known there is still light at the end of the tunnel. Whether it’s enough of a light is one thing, but it’s nice to see them back on their feet. But now comes the fun part, next episode is ANOTHER lull, for McGillis/Tekkadan regroup at Tekkadan’s HQ. So before we head off into the final battle, we’ll see them back where it all began. This is good, and as I noted above is the welcome reprieve. Why? It’s because she needs to have a say. We can’t end it all without her, the very person whose humble request just to talk about Martian half-metals at a podunk Canadian Midwest capital started it all. More like Iron-Blooded Nothingness. We’ll see you next week if there’re some things to talk about there.